Corporate Social Responsibility represents for Del Oro a continuous commitment to social and economic development of workers, the community and the environment through a fair responsible business practice for all. In the last year, Del Oro has consolidated projects like the scholarship program. With this program, 15 workers‘ children benefit with up to $70 per month to help them with their school expenses. Children with special education needs benefit with this program too. We have expanded our support for school canteens. In the past two years we have donated gallons of concentrate to 6 schools in La Cruz and so more than 3492 children have been benefited. 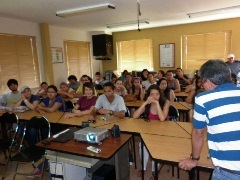 In 2012 we received more than 300 students from universities, technical high schools and elementary schools as a part of our academic tours program. This program aims to integrate students with the reality of work, showing them how the citrus industry operates, the standards of quality demanded by today’s international markets, the technological developments and the latest research that the company carries on agriculture to ensure higher quality fruits. In addition, Del Oro promotes the integration of communities to their own social development through support programs for specific projects. 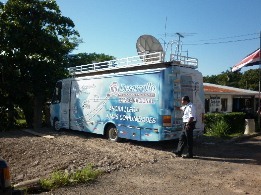 In the last year through a partnership with the National Bank a mobile ATM machine was installed in the community of Santa Cecilia, with the possibility to install it permanently. We have constructed and given ongoing maintenance to many bus stops that have been requested by different communities. Del Oro exemplifies respect for the environment in all of its activities. Del Oro owns 5,000 ha. in which a perfect balance between nature and agriculture. Read more..
Del Oro produces and markets its products in all major world markets, selling to some of the most demanding customers. Due to our storage capacity, Del Oro assures product availability throughout the year. Mature and wholesome fruits are used for manufacturing Del Oro S.A. high quality products. Read more..